As Novatek's Yamal LNG project ramps up production, it faces a shortage in its shipping capacity. 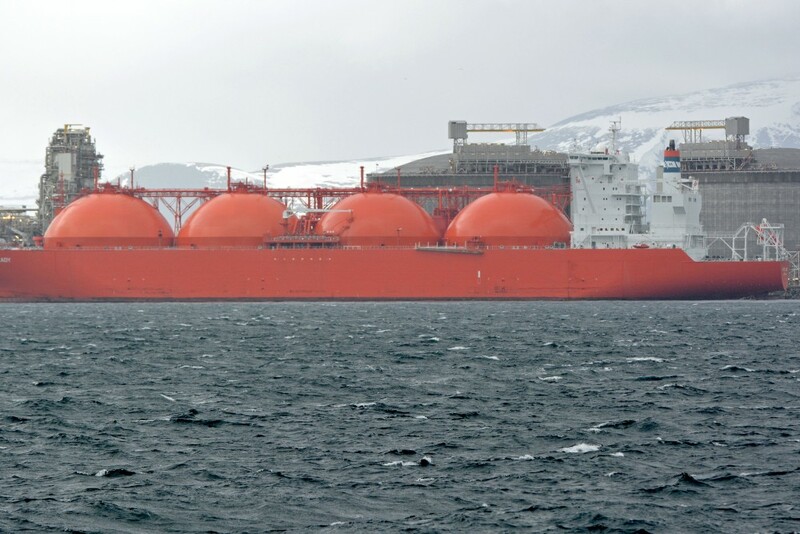 Novatek might engage in large-scale ship-to-ship reloading of liquefied natural gas at three sites in Arctic Norway. In a letter sent to the Norwegian Directorate for Civil Protection (DSB), company Norterminal requests permission to start up operations in partnership with the Russian natural gas producer. According to the letter, obtained by the Barents Observer, Novatek needs the reloading because of a mismatch in production capacity and export capacity. As Novatek’s second train of the Yamal LNG project comes into production, presumably in November 2018, the company will simply not have the sufficient LNG carriers for out-shipments. By establishing ship-to-ship reloading facilities in Norway, the fleet of powerful ice-class tankers will be able to significantly cut sailing distances. Instead of going all the way to western European ports, the costly ships will shuttle to and from the Norwegian Arctic fjords. It will help save time. And also cut transportation costs. Norterminal, the Norwegian company owned by Jacob Stolt Nielsen, says it is taking part in a tender organised by Novatek and that signals are positive. Novatek has confirmed that the solution offered by the Norwegians is the best, the letter sent to the Directorate for Civil Protection reads. Norterminal representative Arne B. Ramstad underlines to the Barents Observer that there still is a way to go before operations can start, and that the company first has to show that it can provide necessary capacities. “We are still in a preparation phase, and no contracts have been signed,” Ramstad underlines. Potential volumes are huge, and three Norwegian sites will be needed, Norterminal explains in its letter. On each site, there will be a monthly up to 15 ship-to-ship operations. Two of the sites are located in fjords near Kirkenes, the border town, and a third near Honningsvåg, the far northern town on the Barents Sea coast. The first small-scale reloading operations could start as soon as mid-November 2018. A subsequent increase in volumes would follow in December, January and all the way until June 2019. After that, it is not clear what volumes will be needed, because of uncertainties related to markets and the number of new LNG carriers included in the shipments, Norterminal says. The total of 45 reloading operations per month will include several hundred thousand tons of LNG. It all comes from the Yamal Peninsula, where Novatek in December 2017 officially launched production at the first of three production trains in its grand Yamal LNG. Each train includes production of 5.5 million tons of LNG. With the opening of the second train in November this year, Novatek will ultimately produce up to 11 million tons of liquefied natural gas per year, or more than 900,000 tons per month. At the moment, the the Russian company has five LNG carriers at its disposal. That number will gradually increase to 15. They all have top-class ice protection Arc7 and are far more expensive to operate than conventional carriers. Novatek is looking at new terminal facilities not only in Arctic Norway, but also on the Russian Pacific coast. In October 2017, the company signed an agreement with regional authorities in Kamchatka and early this year made clear that a transshipment hub will be built in Bechevinka, an abandoned Navy compound in the region. That will have a capacity to handle up to 20 million tons of LNG per year. All of it will be shipped along the Northern Sea Route and subsequently delivered to Asian buyers. The company Norterminal has long experience from Arctic ship-to-ship reloading, but not with LNG. In the period 2014-2016, the company organized major oil reloading operations for Lukoil with annual volumes exceeding six million tons. The company is also working for the establishment of a new land-based terminal in an area near Kirkenes. According to Norterminal owner Jacob Stolt-Nielsen, that projected terminal in Kirkenes would be able to handle both oil and LNG. “It will be an important facility for logistics in the Arctic,” Stolt-Nielsen says in a comment to the Barents Observer. The company in December 2017 got the site fully regulated for the purpose. Norterminal in 2016 ended its ship-to-ship reloading of oil as Lukoil decided to move operations to domestic facilities in Murmansk. Behind the move was a good dose of political considerations. Politics will be a key issue also in the case with LNG. The Yamal LNG is a project of major national importance and the establishment of key activities outside Russia will not be well perceived by government interests neither in Moscow, nor Murmansk. The Russian Arctic city located only 200 kilometers from the border to Norway is already an important site for Novatek’s investments in LNG, and regional authorities will not be happy about establishment of ship-to-ship operations by competing Norwegian interests. But Town Mayor of Kirkenes, Rune Rafaelsen, does not see the LNG-plans in his home waters as encroachment on Russian interests. “This project will promote Norwegian-Russian cooperation and we will do what we can to facilitate,” he says to the Barents Observer.